Ischia, an island in the Bay of Naples, is known for its thermal pools with healing waters and its health spas. The water from the natural hot springs, heated by volcanic action, is believed to be the most radioactive in Europe and is good for a variety of health treatments including rheumatism. The thermal springs have been popular since Greek and Roman times and spas and resorts have been built up around the best ones. Ischia sees fewer tourists than its neighboring island, Capri, although in summer it's popular with Italians and Germans. The island is a good place for a relaxing vacation, especially in spring and fall. In addition to thermal pools, there are beaches, geysers, gardens, ancient ruins, and a castle. We asked Francesca Di Meglio, whose family comes from Ischia, about Ischia spas and thermal pools and she provided me with this information. She says that all of the thermal pools are helpful, based on her personal experience after three knee surgeries, and that they all help your skin tremendously. You don't actually need to stay in a fancy hotel to partake of the healing treatments. Yes, some of the hotels, especially the fancy ones, have their own thermal pools and treatment spas but you could simply stay at an affordable hotel and go to the gardens or spas or pay to enter the treatment centers at one of the hotels. Most of them offer this kind of service. Negombo in Lacco Ameno is Francesca's favorite place for thermal pools. The ten thermal pools are made of concrete and are found in the mountainside so that they blend in with nature. There is also a beach so you can swim in the sea, too. Negombo is a thermal pool park, and you don't need a reservation. You can just show up, pay the fee and enter. If you want massages or some other personal treatment though, you should call ahead and make a reservation. Poseidon is the most famous and largest of the thermal parks. It is lovely, set next to the sea where you can swim, and has about 20 pools of different temperatures, some with waterfall or hydro massage. The thermal pools here are typical pools fed by natural hot springs. There are gardens, restaurants, and a bar. It's a little expensive. 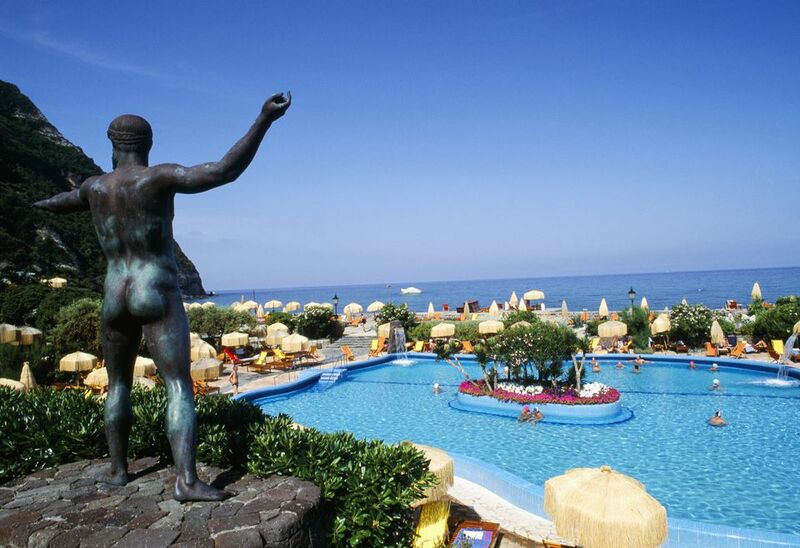 Poseidon Gardens is on the Bay of Citara, on Ischia's west side. Cavascura, in Sant' Angelo, is probably considered the best healing treatment spa and their thermal pools are thought to be the oldest. Aphrodite thermal park in Maronti (near Sant' Angelo) has a great reputation. Aphrodite has eight thermal pools and a beach. Classic treatments, such as mud baths and massage, are available. Castiglione is a more economical choice for thermal pools, making it popular with kids and families, so it can be crowded and less relaxing. If you're traveling with kids, Castiglione would be a good choice. The thermal springs here have been known since Roman times. In addition to the nine thermal pools, there is an Olympic-sized pool with sea water and two covered pools. Nitrodi in Buonopane (in the comune di Barano) has healing showers and the water is best known for helping with skin ailments.